As many of you know today is show-n-tell day. 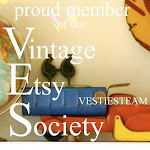 hosted by ShabbyScraps Blog. She said that she's got over 50 participants hop over to her blog and check out the other participants. My form is not old, she's made of metal her name is Emma Katherene after both of my grandmothers. I got her to display some of the jewelry that I sell. I drapped her in left over muslin, and some vintage lace pulled to one side. Attached with these sweet vintage buttons. I have a couple of other small wire forms, but I haven't had time to dress them up for the show. Hey, Margo! Blogger has identified my blog as a possible SPAM robot and has blocked my post! Please do me a favor and let your readers know that I have, at least for today, posted my forms here. I love this picture. It's on a card my DH got me for no special occasion. Inside he wrote "you're incredible" What a great guy!!! a girl accomplishing amazing things, like moving mountains. I choose to see a little girl accomplishing amazing things. Go out today, and do something amazing. It is not uncommon for me to run into Sand Flat Farm Vickie when I'm out shopping the sales on Thursday's and Friday's. And We've "accidentally" met at one both this week and last week. As a matter of fact she wrote about our accidental meeting in her last blog entry. We must be on the same schedule. And today I ran into Stitchin Tina when I went up to my booth to remove an item I had sold on-line. Then I took Tina to a store in town that I had just found. They have some great displays and I've got permission to come back next week and take some pictures. I always love bumping into fellow junkers while I'm out. I actually met Tina because of blogging and Vickie I met when she came to my Barn sale last year, and then she began reading my blog. Now she blogs as well. While out shopping the sales yesterday, besides meeting up with Vickie I was able to pick up a few interesting things. These great old coffee cans with wonderful graphics. I'll be listing them on ebay tomorrow. Thank you all for you suggestions on what to do with that old side table (see below). Stacey had a great idea and I was so inspired I had to get out to the barn and make it. I'm still waiting for paint to dry, so I couldn't write anything clever on the chalk board. It was a great idea and Thanks again Stacey for being my inspiration. Looks to be a great show and tell project. I've got some more of my Flatware necklaces in my store so check them out. Have a great Thursday, I've got 2 sales this morning, Love going to the sales. Several of you wanted to see what my display piece looked like when I got it up to my booth. I picked up this piece for "free" at a GS. It was one of those "if you want it, take it" kinda things. Well of course I wanted it. Now I could always add legs and bring it back to what it was, but that is boring. Do ya'll have any ideas of what I could do with it? Anyway, I loved Joy's pictures so much that I decided to jump on this bandwagon and look for my Ephemera. I didn't think I had much, but I was so wrong. First I have these old report cards from Paris. No not France... Texas. They are for sale in my booth, but I will also sell them online. I love these old notebooks, the dust pan is available on my ebay. And then there are the wonderful word flashcards, like the one above. I have some of them for sale this week on my ebay too. I have a thing for flash cards lately and I picked up these a few weeks ago. These old number cards are so much fun. I have lots available if you are interested. I got this several years ago and I love it. the cards are smaller than regular cards, and I have almost all the letters. These are great for spelling out words in my hutch or holiday displays. More word flashcards, and some old Dairy tickets. There's that tip clip board again. Don't ya just love it. Love these dairy coupons. I have a few pages available for sale. Valorie of the Red Shed gave me these great old folders with letters A & M. No I'm not an Aggie, those are my initials. I found these great file folders last week and they are available on my ebay this week. Love this booklet I picked up from the veranda last month. Travel ephemera, displayed in a small suitcase. this is my inspriation board with several pieces of ephemera on it. Holiday cards, valentines, BINGO, letter cards pictures etc. I love the old drying rack, and have never seen another like it. there that are of local interest. And I love that note book with the plane. Well that is not all, but that is all I'm showing today. Now it's your turn. Show and Tell. I still have some painting issues to work out, but you can't see it on the pics. I'm going to use this as a display in my booth for now. I filled the hole in the door where leaded glass used to be (before I bought it) with an old crib spring thing. This will be great for display purposes. Someday I'm going to bring it home and put it in my cottage bedroom (when sons move out). It will be a bed side table thingie, I'll probably hang a wreath or some architectural piece in the center at that time. It could also be a potting bench for outside. I loved the door, picked it up last year, with the knob and all the architectural details and the color that you see. This is pretty much what I always had in mind for it. The awning idea came last week, and then I was inspired to do the project. I may add more 2 more hooks on the sides, to hang items from, can't decide yet. And here's the best part. I made it all from stuff I already had, didn't have to buy anything. The awning is some shutters I was given. The wood on the table top is reclaimed, the front curved piece, is part of an old headboard. The legs were some old ones I probably picked up out of the trash. The spindles that hold the awning were found in a crib on the side of the road. Of course the door and crib screen were purchased in garage sales during the year, without any idea what I'd do with them. I love this hobby. on them that you like and change it at any time. They are strong and durable, but not suitable for outdoor use. I promise I'm gonna get to those awards and tags. Added at 6:00pm. I got this weird email in my inbox from reunion.com that said someone was looking for me. I clicked it to find out more and before I knew it reunion.com had grabbed every address in my hotmail account and sent them an email saying I was looking for them. If you got one of these, I am sorry, just ignore it. About a week ago I ordered these great bottles with enamel tags on them from Joy, and they arrived in my mail today. I can truly say I had Joy in my mailbox. After opening her beautiful packaging, I was amazed at how truly tiny they are. I knew they were small, but these are just the cutest things. Don't they look great in their new home. My B&W is coming right along. Thanks Joy, you sell the best stuff. I've been busy making my flatware necklaces and I thought I'd share a few new designs with you. They are all on Pony Lacing with either a toggle or hook closure and around 18 in length. Flatware portion, can be changed between necklaces very easily. They are $18.00 ea and shipping costs are minimal. email me if you are interested. Hum what could I be working on now. Story Contributions needed I'm collecting stories of junking adventures and mis-adventures for my web site magazine. If you have a great junking story that you'd like to share, please send it to me. I will be putting one new story on my web page per week. Your name and web site (if you have one) will be attached to the story. So if you want to publicize your blog, send me a story. I will make the sole decision as to which stories I publish, and you will be notified when your story is going to be used. Over the past week I've been tagged and given 2 awards. Thank you all for sending these honors my way. I promise to fulfill my end of these soon, and pass them on.